Canadian Financial Summit – All Online – and FREE! The bloggers behind Young and Thrifty have organized a virtual Canadian Financial Summit (CFS) starring 25+ personal finance experts in the country. Some of these experts include: Andrew Hallam (Author of Millionaire Teacher); Jon Chevreau (former editor of MoneySense Magazine); Peter Hodson (CEO of 5i Research Inc); Preet Banerjee (CBC’s The National Commentator); Ellen Roseman (Columnist at Toronto Star); Rob Carrick (Columnist at The Globe and Mail); and many more. In addition to these mainstream media experts, a number of popular Canadian finance bloggers will be participating, including but not limited to: Mark Seed (My Own Advisor); Robb Engen (Boomer and Echo); Tom Drake (Maple Money); and, Stephen Weyman (Credit Card Genius – side note: awesome free credit card selector tool). Oh, and Million Dollar Journey has been invited to do an online presentation about my financial journey, tips on how to become a millionaire, and finishing off with a little bit about my financial freedom goal. While you won’t see my face in the presentation, you’ll hear my voice and even a couple pictures of my kids! This Virtual Summit will cut through the fog of confusing financial jargon and build the confidence needed to seize control of your personal finances. Each speaker will pull back the curtain on their unique area of expertise. With their actionable advice and attention-grabbing speaking styles, these experienced Canadian gurus will help take your money game to the next level – no matter if it’s your first day at the financial dojo or if you’re already a 3rd-degree blackbelt in financial literacy. 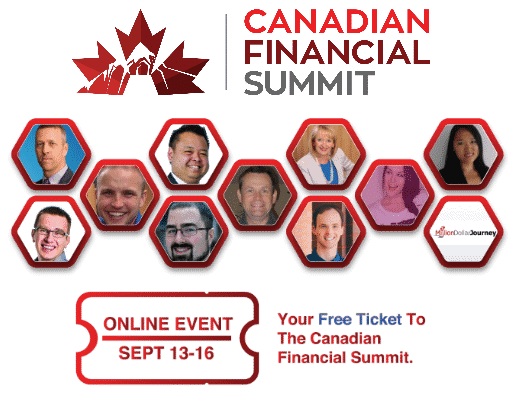 The Canadian Financial Summit will show you how save hundreds on monthly costs, earn thousands more in investment returns, and provide examples of people that measure their net worth in millions. A live webinar will start on September 13 with presentations on September 14th, 15th (I’m presenting on that day) and 16th. You can see the full schedule here. This summit is free to view when it launches for a period of 48 hours. Specifically, you’ll get 48 hours to watch the video after it has posted online. If you feel that the videos add long term value to you, you can sign up for unlimited access for a one-time fee starting at $87 (early bird only – ie. before September 13, 2017). Full details here. As I mentioned, the videos in the Canadian Financial Summit are free for 48 hours after the video is posted. If you’ve been following MDJ, and interested in seeing my presentation on how to become a millionaire – Sign up for FREE here. Next post: Financial Freedom Update (Q3) – Sept 2017 (+5.56%) – Major Milestone!